Panel: What Does Science Tell Us About Violent Video Games? Panel: Does Media Multitasking Change the Structure of the Developing Brain? Panel: Digital Immersion in Children and Adolescents: Addiction or Obsession? As part of Children and Screens’ ongoing support and curation of cutting-edge, objective, scientifically-rigorous interdisciplinary research, we invited nearly 140 preeminent experts from 10 different disciplines in 22 workgroups to compile the latest research on the effects of media on growth and development, cognition and mental health in toddlers, children and adolescents. The resulting findings were aggregated and published in a special supplement, “Children, Adolescents, and Screens: What We Know and What We Need to Learn”, in the highly-regarded journal Pediatrics, released on November 1, 2017. Subsequent new research has also been synthesized and presented where applicable. Small screen technology is almost completely pervasive. The apps that go with the hardware are designed by people with a good working knowledge of how to make them capture the attention of an already distracted populace. And when we are driving, areas of the brain that might otherwise tell us to ignore the threat that smart devices and infotainment systems create, is being used for the task of driving. A driver, especially a young driver, has no willpower to ignore the lure of the small screen. The time has come for an approach to this risk that requires designers of the hardware to abide by rules to prevent crashes. It is not enough to say that “people make choices.” This was the same logic that led to an epidemic of smoking. What helped to curb that epidemic were rules and laws to make it hard to make a poor choice. And it will require a similar approach in the face of the small screens that are being built to be addictive. Are laws effective at changing distracted driving? Yes. As with all laws, they must be clear and they must be enforced. As drunk driving enforcement showed, an increase in the enforcement of laws already on the books can change attitudes and behaviors. Won’t technology save us from distracted driving? No. By some estimates, even if we developed fully autonomous cars now, it would take 40 years for them to be pervasive. And technologies that distract us are getting even more attractive and attention consuming. Is distracted driving really a problem? Yes. The Unites States is already one of the least safe industrialized countries from a crash-risk perspective. And it is getting worse despite improved vehicles, improved roads, improved emergency responses and better medical care following a crash. We are going the wrong way in terms of safety. 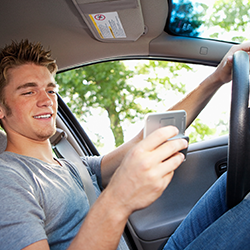 Teen driver laws should be written to keep digital distractions in cars to a minimum. Automakers should be required to give drivers easy access to disable infotainment features in the car. Game and app makers for smartphones should design products for mobile devices that will turn off or disable themselves if they detect that the user is driving. You are the willpower system for your child. A fully functional willpower system will not develop until your child is in her or his early 20s. They are faced with technologies that are designed to highjack their attention; that requires strong willpower to ignore. You have to set rules and boundaries and enforce them. For example, require your child to put their phone in the trunk when they drive, and enforce consequences if they fail to do so. If the phone is someplace the driver can access it, like the glove compartment, it needs to be turned off to prevent incoming prompts that will encourage a driver to get to it even if it's put away. Encourage your child to set a good example for their friends. Explain why overuse of small screens is a problem and encourage your child to share that with others when they limit their own use. Set a good example yourself. Recognize that these devices are a primary means of communicating with friends for the digital generation. Be empathetic in your approach. Completely eliminating the use of devices that your child uses to connect with their peers is not practical, so design your own plan to provide reasonable use and healthy alternatives. The analysis, conclusions, and recommendations contained in each paper are solely a product of the individual workgroup and are not the policy or opinions of, nor do they represent an endorsement by, Children and Screens: Institute of Digital Media and Child Development. Children and Screens is the leading national, independent, interdisciplinary research organization that supports and advances objective, integrative scientific research by scholars, neuroscientists, clinicians, educators, and experts in pediatrics, psychology, psychiatry, child development, public health, communication, computer science, and other relevant disciplines.